My department at work is all girls. I wanted to give each of them a little gift for "The Holidays". 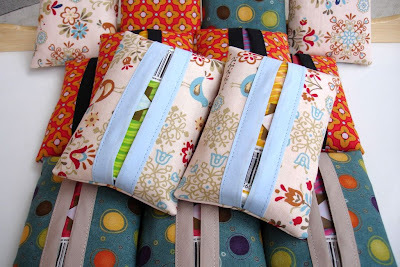 I made "Tissue Holders" from the tutorial found at Whip Up. I made a total of 15 and it took me about 4 hours from beginning to end. Best part is I had all the supplies in my stash! I think they turned out super-cute and I hope the girls will like them. They are the perfect size to pop in you purse or keep in you desk drawer. 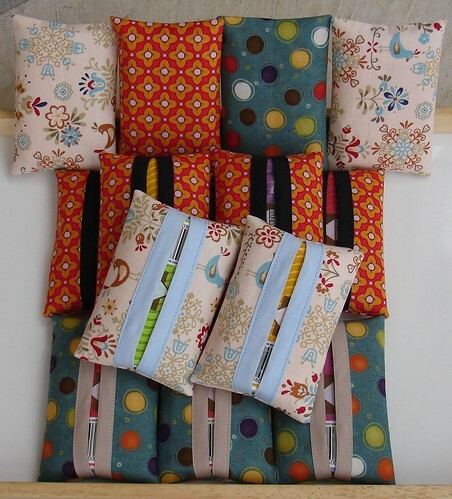 Quilting Newbie, one of these is yours......let me know your colour preference. Well yes, I really am this old today. However, my birthday gift from my husband always makes it worth getting older. Each year he gets me a bottle of wine that costs the same as my age. MMM....can't wait till I'm like 80! Phew, what a busy weekend it's been. 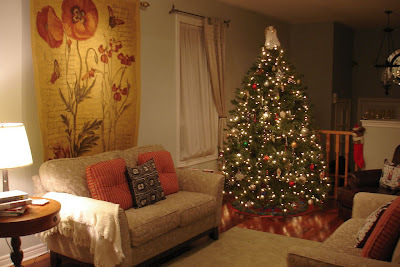 I put up our tree and rearranged the living room furniture. Our friends birthday party on Saturday was so much fun and it was great to see many of our friends. This evening I went over to Quilting Newbies house for some yummy snacks and a good giggle. Not to brag or anything, but my tree is absolutely huge! My husband picked it up for us from White Rose on boxing day before they went out of business. Of course we did not put it up until the following year and were shocked at how big it is. See at the bottom, you can barely see the tree skirt I made for it. 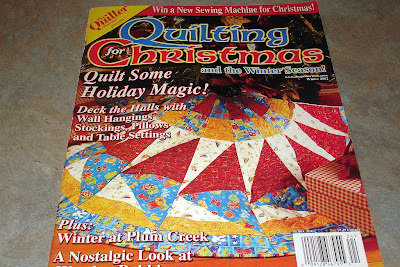 Which brings me to this, I won an E-bay bid a few years ago on a group of quilting magazines. This magazine is from 2002 and I think I made this quilt about 3 summers ago. 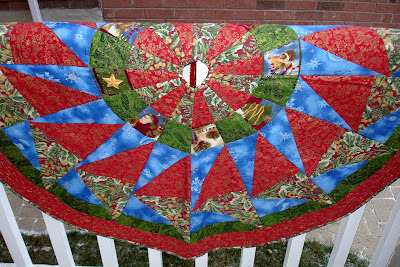 The pattern was called "Pieces of Whimsy Tree Skirt". Honestly, this is my most favourite quilting project I have made so far. 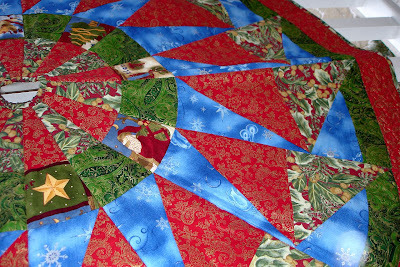 It challenged my skills with the curved borders; I almost gave up a few times. I'm so glad I held out and completed it. I love the colours, and as we all know I'm a sucker for any kind of fabric with "sparkles". The back is white damask fabric with a snowflake pattern. I stitched in the ditch for the top section and stippled the bottom rows. 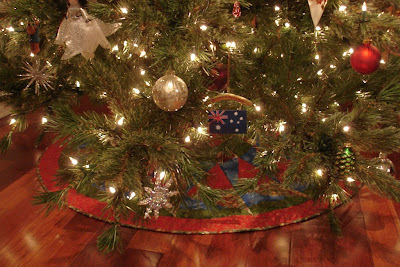 It really is such a shame that the ginormous tree dwarfs my tree skirt!! Sorry for the grainy pictures, my camera does not really like the night, cause I'm sure it's not the photographer! Hey There! Just wanted to drop by and let you know that I'm still around. The holiday season is upon us and things are getting so busy. This is the lovely view from my desk at work. 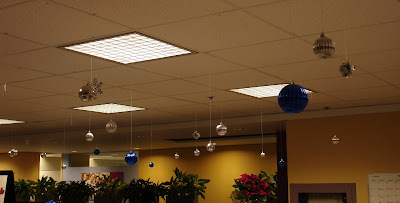 We decided to use a silver and blue theme this year, last year it was snowflakes. I've spent tonight making Chocolate Crunch Cookies (recipe here) as a birthday gift for a friend of ours who's party were going to on Saturday which I know will be lot's of fun. 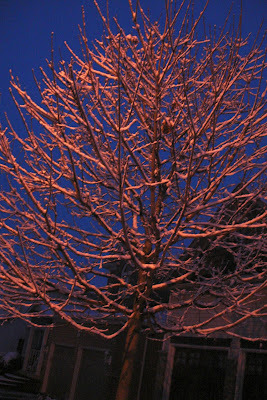 I let the dog out early the other morning, it had lightly snowed during the night and everything was lightly dusted with fluffy snow. It was so peaceful and quiet; I just had to take a picture.